Since 1971 we started with great care we make to the well-known dairy and dairy products "yogurt and feta KOMIS". Already our grandparents had knowledge so family started to offer unique flavors pure dairy products made with milk our own production. In the same way we continue today, but with the most modern technological facilities. 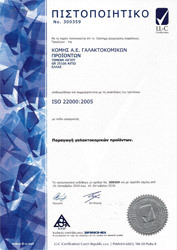 We renewed our products and packaging and created a new factory in 2011, expanding our network. We come now to you in Achaia, Corinthia, Argolida, Arcadia, Attica. Sheep yogurt and our slice consists of 100% Greek sheep's milk. 60% of sheep's milk based on our own animals, grazing cuticles Kalavryta. Cow yogurt with rice pudding and cream, consisting of 100% Greek milk cow grazing Petsakon Kalavryta. All our products are produced in the traditional way, without admixture maintained and chemicals. 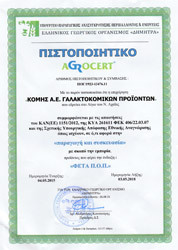 Our company experience in producing traditional yogurt for 40 years, has managed to combine tradition with modern technology, harmonizing the conditions of production, preservation and transportation of our products with ISO:22000, ISO:9001 and Certificate Agrocert for the product "FETA P.O.P. ".